The period since the last issue of Mountain Views has been quiet. Four Parliamentary Questions have been lodged and answered as set out below. NEMT initiated the three questions lodged by Alison Johnstone. The purpose of the questions is to keep the issue alive and to not get quietly pushed under the carpet. We are very grateful to Alison for helping us keep the issue of mountain hare persecution alive. To ask the Scottish Government what its position is on the culling of mountain hares on estates practising driven grouse shooting. "The Scottish Government does not support large, indiscriminate culls of mountain hares in Scotland, and recognises the concerns that have been expressed about the status of mountain hare populations in Scotland. The Scottish Government acknowledges that mountain hares are a legitimate quarry species and that there may be local requirements to control mountain hares to protect gamebirds and young trees. 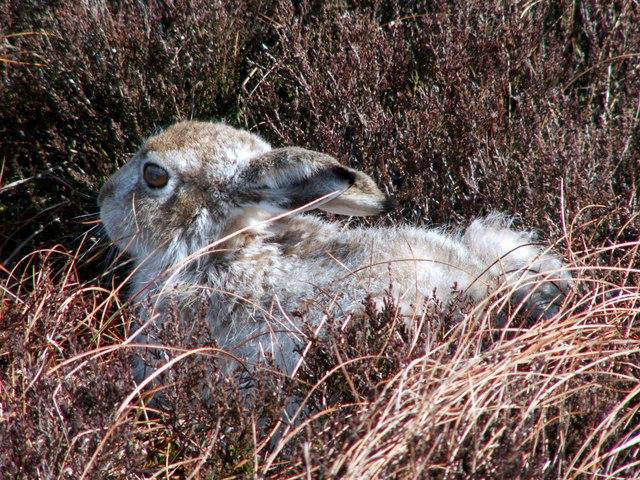 Any control of mountain hares should be undertaken in accordance with obligations under the EU Habitats Directive. Given the concerns about possible over-exploitation, information on the management of hares has been reviewed by independent experts from the Scottish Natural Heritage (SNH) Scientific Advisory Committee. This review was published in October 2015. The review identified the need for improved monitoring and data to assess national trends of mountain hare populations. This work is underway in the form of a collaborative four year study (2014-17) involving SNH and scientists in the James Hutton Institute and the Game and Wildlife Conservation Trust, on trialling various methods of counting hares. The study has the aim of developing a reliable and cost-effective means of assessing mountain hare population density. SNH is also working with Scottish Land & Estates to encourage greater transparency in the reasons why estates cull hares and to encourage estates to collaborate and develop a more measured and coordinated approach to sustainable hare management." "Hare management requires to be undertaken in accordance with obligations under the Conservation (Natural Habitats, &c.) Regulations 1994 (as amended in Scotland) which implements the EU Habitats Directive 92/43/EEC of 21 May 1992 on the conservation of natural habitats and of wild fauna and flora in Scotland. This means hare populations must be managed sustainably and their management should also not compromise the conservation status of the species. Certain methods of killing or taking mountain hares are also prohibited, including any means which is indiscriminate and capable of causing the local disappearance of, or serious disturbance to, a hare population. Scottish Natural Heritage is working with Scottish Land & Estates to encourage estates to be more transparent about the reasons for culling hares and to encourage estates in the same area to collaborate and develop a more measured and coordinated approach to sustainable hare management. The intention is for additional information from the Game & Wildlife Conservation Trust National Gamebag Census to be made available in order to help inform these strategic decisions." To ask the Scottish Government, pending research on the health of mountain hare populations, what its position is on introducing a moratorium on the shooting of mountain hares. "The Scottish Government recognises the concerns that have been expressed about the level of exploitation of mountain hares in some areas and has put in place research to gather data on population levels. In the meantime, proportionate management of mountain hares as a quarry species and to protect trees and gamebirds can continue. Should evidence emerge of large indiscriminate culls that could threaten local populations of mountain hares then we will consider if further measures such as a moratorium are necessary." To ask the Scottish Government, in light of its requirements under the habitats directive, what action it will take to estimate the size of the mountain hare population. "A review of moorland management was undertaken by independent experts from the Scottish Natural Heritage Scientific Advisory Committee. This review was published in October 2015, and identified the need for improved monitoring and data to assess national trends of mountain hare populations. This work is underway in the form of a collaborative four year (2014-17) study involving Scottish Natural Heritage, the James Hutton Institute and the Game & Wildlife Conservation Trust, acting on the advice of several mountain hare experts, to trial a range of methods of assessing mountain hare numbers, to develop a better monitoring strategy, and to improve the quality of the information used to assess population status and the sustainability of hare management measures." The Scottish Raptor Study Group has tabled a petition on the Scottish Parliament website calling for licensing of driven grouse moors. Such a proposal would have a significant benefit for mountain hares and is discussed in more detail later.